If you are serious about starting to eat low calorie food, either as a new healthy eating plan or as an aid to weight loss, the most obvious first step is to reduce the amount of fat you eat. Fat clocks up an amazing 9 calories for every gram we eat, as opposed to 4 for carbohydrates and 4 for proteins. That is not to say we can do without fats altogether. Along with proteins, carbohydrates, minerals and vitamins our bodies need a certain amount of fat, even in a weight loss programme, but crucially in the form of unsaturated fats. Fatty foods contribute greatly to the incidence of heart disease; and this has led to health campaigns to try to rid Britain of the unenviable distinction of being near the top of the world’s heart disease tables. Something as simple as switching from whole milk to semi-skimmed or skimmed, can make a big difference. Semi-skimmed milk has all the nutritional benefits of whole milk (though not for babies up to two years) but with only 98 calories per 20 mls compared to 134 calories in whole milk. Skimmed milk has only 68 calories per 20 mls but is not suitable for children under five. In moderation, very few foods are really bad for us. If we make low calorie choices and choose to steam, bake or grill food instead of frying in oil and fat, we can achieve a good balance for healthy eating. Low calorie recipes can be as tasty and nutritious as high calorie dishes and the calorie value can be lowered by substituting certain ingredients. butter typically has 740 calories, including 81 grams of fat. spread made with buttermilk and vegetable oils has around 680 calories and 75 grams of fat. spread made from olive oil has around 540 calories and 59 grams of fat. pasta sauce will generally have around 90 calories with 5.7 grams of fat. curry sauce will have around 206 calories and 16.2 grams of fat. labelled low fat versions of these prepared sauces are often fairly high in calories. 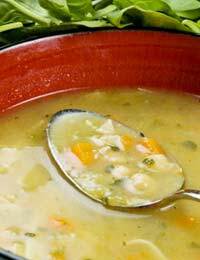 Home made soup makes an appetising start to a main meal; and served with crusty brown bread makes a satisfying lunch on its own. Place carrots, onion and celery in a large saucepan and add the stock. Bring to the boil, cover and simmer for 10 minutes. Meanwhile peel, core and dice two apples and add them with the tomato puree, bay leaf and caster sugar to the saucepan. Bring to the boil, reduce the heat, half cover the pan and simmer for 20 minutes. Remove and discard the bay leaf. Place the carrot and apple mixture in a blender or food processor and blend until smooth (or press the mixture through a sieve with the back of a wooden spoon). Gently reheat the soup if necessary and season with salt and pepper. Serve in warm bowls, topped with the shredded celery leaves. Place the tomatoes in a food processor and blend until smooth. Lightly oil (or spray oil) a large frying pan and place over a low heat. Add the garlic and saute briefly. Add the pureed tomatoes, tomato paste, oregano and pepper. Bring to the boil, then reduce to a low heat. Simmer uncovered for about 10 minutes, allowing sauce to thicken slightly and flavours to blend. Remove from the heat and stir in the basil. Toss with pasta to serve.